Work smarter not harder. Delegate, delegate, delegate. If you want something done, get a busy person to do it. Wise words for the time-strapped librarian. Know what’s even smarter? Not spending a dime to do so. The cash-strapped librarian is challenged to “do more with less”* and still be the modern miracle worker that he/she is. The Outreach Librarian will start exploring ways to get others to do the work for you and hopefully, on the cheap/free. Today’s topic: art in the library. As we struggle to convince funders, tax payers, and administrators that libraries are not irrelevant book houses, hosting art in our spaces is a valuable tool for showing the myriad ways we promote culture and education. Not only does art create a pleasing visual space for visitors, it solidifies one of our important roles: promoters of the arts. Not all of us have access to site-created works or a Chihuly. 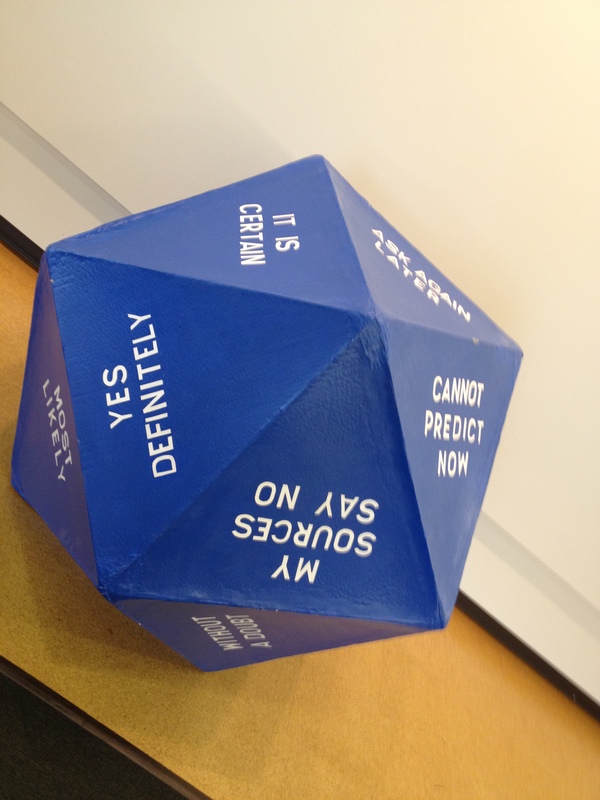 We’re thinking this is how we’ll handle all questions from now on. I prioritize student work first. But, I personally struggle with getting student work up. Often the work is not properly framed, students want their work back by certain times which leaves holes, or they are works in progress. I still work to get student art in the library. Currently, our library is hosting these two gems. 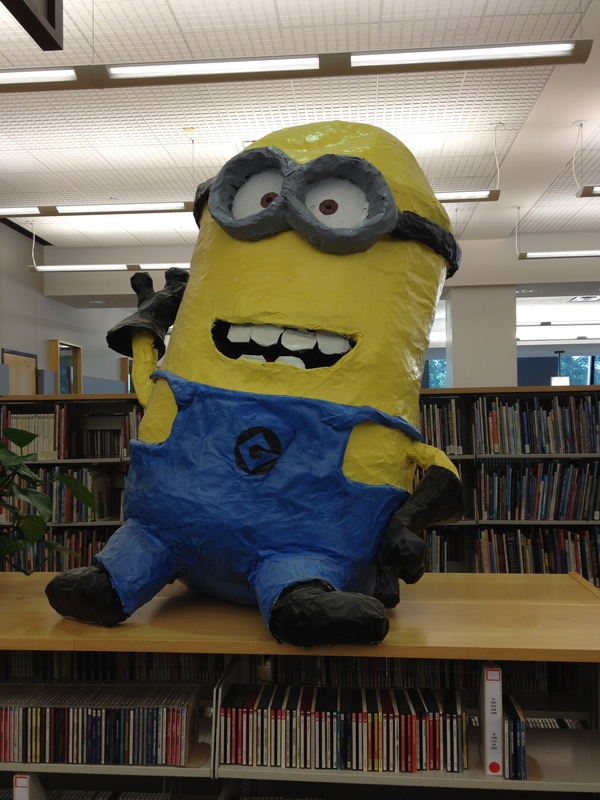 Happy minion: a role model for our student staff. I’ve found some other reliable means for hosting art in our library: outside sources. I met a local gallery owner while working on our community’s Big Read. As part of the Big Read, we hosted art in our library community members created around the book. Which is just a great idea in itself. 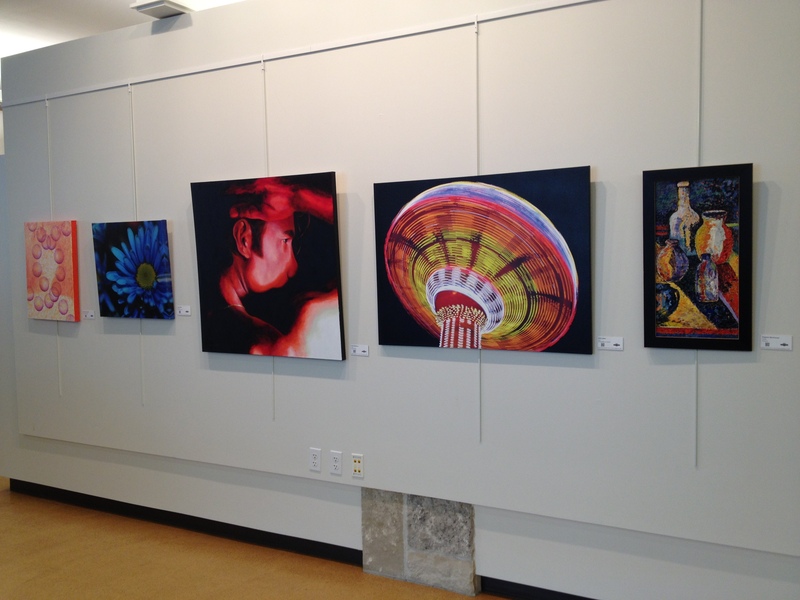 We received positive feedback on the exhibit and I asked the owner if she would consider loaning us art for display. The partnership is symbiotic of the highest order: local artists are exhibited, a wider audience views their work (and can buy them by calling the gallery), the gallery gets a wider audience, and we have excellent art on our walls year-round. We have a large sign next to the art informing viewers the art is courtesy of the gallery and how they could purchase said pieces of art. Plus we’ve added the gallery’s materials to our pamphlet holder. It’s an excellent way to do outreach with your community. For us, it’s also a way to expose our students to elements in the community they might not come into contact with. Voila! Beautiful art on our wall courtesy of a local gallery. Everyone wins. The oddest, but most effective way I’ve gotten art in our library is through the nearest foreign embassy! An international business professor with ties to the Taiwanese embassy put them in touch with me when they were looking for a venue to host framed photos in honor of their anniversary. All I had to do was hand the art up. I had an instant 50-piece, already framed with captions made exhibit that made my library look amazing for months. Often embassies hope to have such exhibits travel. So while the nearest embassies are an hour from me, you might discover they are willing to deliver such exhibits even further away in order to educate more audiences. Steal this wedding idea for your library. Finally, considering hosting an art-making event. At an old job, a colleague came up with the brilliant idea to create a quilt with blank squares folks could decorate. We used foam squares that people could decorate and set up shop at a local community event. You could do this at student orientation, at the local farmer’s market, or set up a table in front of your library. We strung the foam squares with pretty ribbon and had an instant piece to hang up. The best part is, you might garner new patrons who want to stop by and see “their” piece hanging up. 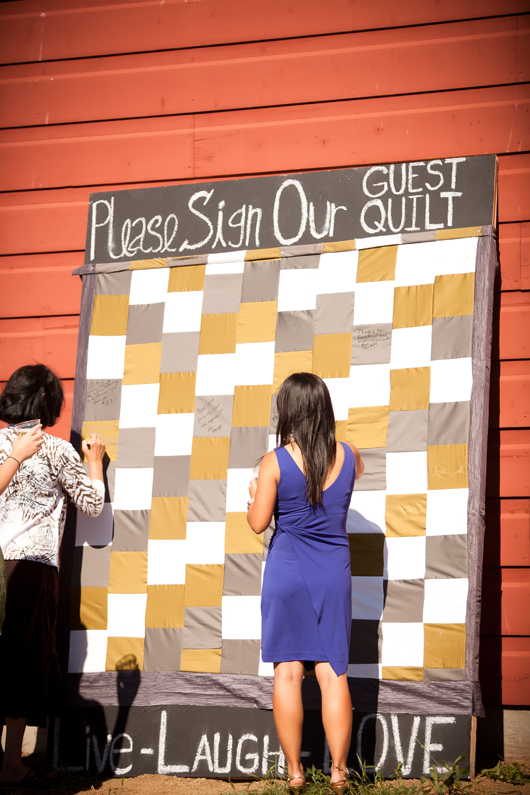 I recently spotted a sewn version (for a wedding guest book) on Pinterest. Perhaps your local quilters’ guild would make it for you (thereby creating another interest group in your library). A quick note on art in our library: we dedicated two blank walls to art walls. We purchased and had installed a system that uses rods on which we can easily hang up to 100 pounds. I recommend researching what works for you, but we went with the Walker display system with which we have been very happy. Good luck and keep on reaching out. *let’s find another way to say this? It’s starting to lose its punch. Send me your suggestions.